1. It's April, and that's means a whole new gallery of inspiration at Write.Click.Scrapbook. This month's theme is Connections. I took the theme for my title and came up with this layout about the things my grandmother, my mother, and I have in common. Aren't these photos cool? That's my grandmother holding my mom, my mom holding me, and me holding my baby. Lot's of Jillibean goodness on this page! 2. Here are a few goodies I made for DT work for my LSS. Papers are 3 Bugs in a Rug, and I used some Jillibean alphas as masks, then inked over them with Tim Holtz distress ink, then sprayed with Smooch Spritz. 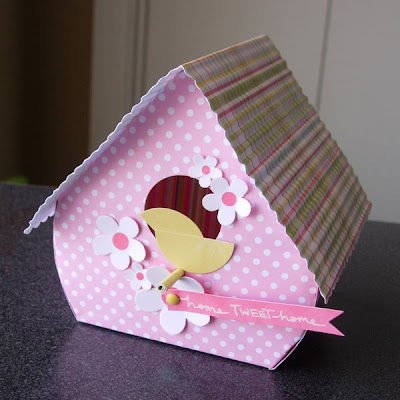 And I used my PAPER CRIMPER for the roof of the birdhouse. How long has it been since YOU'VE used a paper crimper?? 3. Went on a date to the dollar theater with my wonderful hubby and saw this. (Yeah, we're probably the last people to see it.) It is now my new favorite movie of all time. Loved it. Love love love. Labels: three on thursday, write.click.scrapbook. Fabulous projects Aly! I especially love that birdhouse!!! Have a fabulous weekend! LOVED the Blind Side too. I cried...several times...but mostly the hugs.